No matter where you are in life - just getting started or planning for retirement - you have goals and dreams. Advice for Life™ is a client-centric, life-goal approach to financial guidance that reflects your priorities and specific life circumstances. 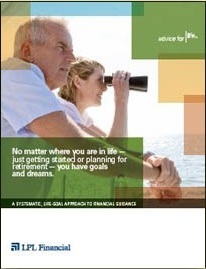 It is a systematic, life-goal approach to financial guidance. Advice for Life™ is a process - a journey, really - that you and I, as your financial guide, will undertake together. By helping you articulate your aspirations, I am better able to understand where you are now and to develop a road map to help you get there. Whatever your hopes for the future, the only way to achieve the vision of how you'll spend the years ahead is to commit to a plan that can take you there. But it doesn't stop there. Advice for Life™ is an ongoing process. Over the course of your lifetime, your dreams, goals, and circumstances can change. Through life's ups and downs, I'll be there to provide guidance, monitor your progress, and help keep your plan in sync with your dreams. The Advice for Life™ approach recognizes that we're all on a special journey - and that each of us requires a road map to help us get to where we want to be. This disciplined planning process has helped other clients eliminate debt, better understand the financial decisions that support their situation, and improve family communication regarding money issues. At Fenway Financial, we believe that adopting a systematic approach that focuses first on your life goals and aspirations may improve the chances of achieving the future that you envision. Don't let your dreams fade. Together we'll chart a path to your future.